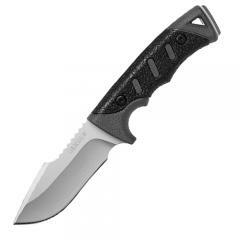 Whittle down the biggest and toughest to do list using the Metolius Plain Edge Fixed Blade Knife from Gerber. Constructed from solid steel with a full tang, the knife boasts unwavering strength and unyielding resilience. With no weak connection points, glue or hinges, the knife has the durability needed to handle the toughest environments with ease. Its meticulously forged drop-point blade has a full bellied edge that offers ample cutting surface cut virtually any job down to size. The rubber, texturized grip is soft enough to provide lasting comfort but grippy enough to ensure maximum retention capability. Deep finger groves provide added control, allowing users to make precision and detailed cuts.